We've all seen mysteries where a sleuth has an animal companion that helps bring important clues to attention. Siamese cats in particular are more common, beloved sidekicks. 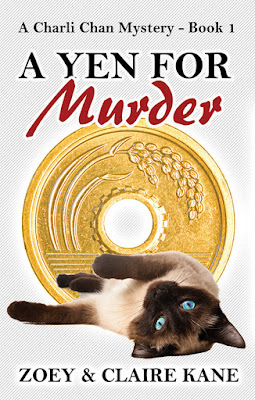 What's different about this mystery, A YEN FOR MURDER, is that it's written in the cat's 1st person POV. Be in the mind of a sophisticated, fun-loving Siamese, as she solves murders in our new Charli Chan mystery series. ABOUT THE BOOK: On a sultry summer night in Santa Monica, the only thing hotter than the busy city streets is murder. Locals awake to the news that a club’s dancer has been strangled, and so a Siamese cat named Charli Chan takes to the streets to investigate. The Strangler leaves a calling card, one golden yen, and when more dancers receive the mysterious coins, panic grips the city. Charli can't resist tugging on every loose thread in the case—curiosity and cats, after all—and she enlists the help of her friend Malcolm, a Scottish terrier with identity issues. Together, they may just find the killer, but the cost to her glamorous human roommate, Harlow Reese, may be more than she is prepared to pay. A Clean Shifter Romance that's funny too!